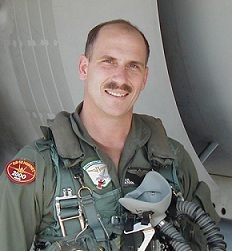 Lieutenant Colonel (ret) Jay A. Stout is a retired Marine Corps fighter pilot. An Indiana native and graduate of Purdue University, he was commissioned on June 1, 1981 and was designated a naval aviator on 13 May 1983. His first fleet assignment was to F-4S Phantoms at MCAS Beaufort, South Carolina. Following a stint as an instructor pilot at NAS Chase Field Texas from 1986 to 1989, he transitioned to the F/A-18 Hornet. He flew the Hornet from bases on both coasts and ultimately retired from MCAS Miramar during 2001. Aside from his flying assignments, he served as the executive officer of 1st Air Naval Gunfire Liaison Company, and in a variety of additional assignments with various staffs around the world. During his twenty-year career he flew more than 4,500 flight hours, including 37 combat missions during Operation Desert Storm. Lieutenant Colonel (ret) Stout has been published in various national journals and newspapers and his work has been read on the floor of the United States Senate. Articles published while he was on active duty addressed controversial topics (women in the military, the MV-22 Osprey, the Super Hornet, the effectiveness of the AV-8B Harrier, etc.). His opinions and viewpoints were often at odds with the service’s senior leadership; nevertheless his cogent arguments, logic and forthrightness earned respect and underscored his credibility. Stout has also written eight books—all published by mainstream publishing houses. Many of them won awards and all have been the subject of positive critical commentary. Stout is a recognized military subject matter expert. He has appeared on the Fox News Network, Al Jazeera and National Public Radio as well as dozens of regional and local network affiliates. Following his military career Stout worked for a very short time as an airline pilot before being furloughed after the terrorist attacks of September 11, 2001. He subsequently flew F/A-18s for the Kuwait Air Force for a year before returning to the States where he now works for as a senior analyst for a leading defense contractor.